Thanks so much to Ashleigh Taylor Photography for giving us the heads up on this publication in Russia. Check out the rest of the feature on Ashleigh’s blog post here. It was quite the spread too.. I love that it’s all in Russian but our names are in English… makes me feel kinda special. Good job, team. Hi folks! I’ve had a difficult time containing the excitement behind this post. Today I am happy to share our Lady Gaga inspired wedding shoot was featured on The Wedding Chicks! Please check it out here. The shoot was also picked up by AMP radio, here. 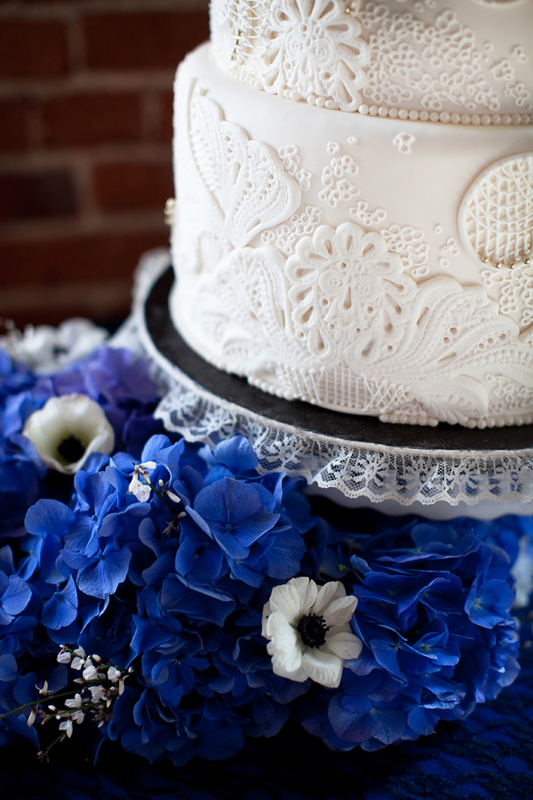 and Utah Bride & Groom blog, here… and Martha’s circle, here. And was mentioned on Bride Finds here. And was mentioned on a French blog (unfortunately I have yet to pass Disc 4 with Pimsleur’s French… but I gather they liked what we did)! We dare say Lady Gaga is the current trend setter & envelope pusher of all fashion and music icons today. So why wouldn’t we be inspired to design a wedding after her? Believe me when I tell you we worked on this shoot with Gaga music on repeat ALL. DAY. It was a great time, and here are some pictures to show for it. 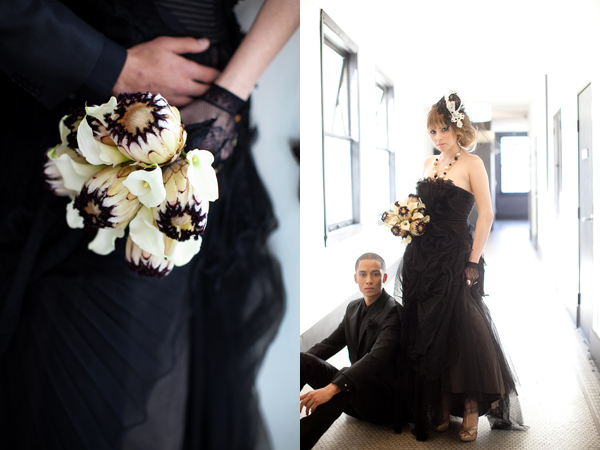 Bunch worked on the design & florals, as well as the hair accessories (so fun!). 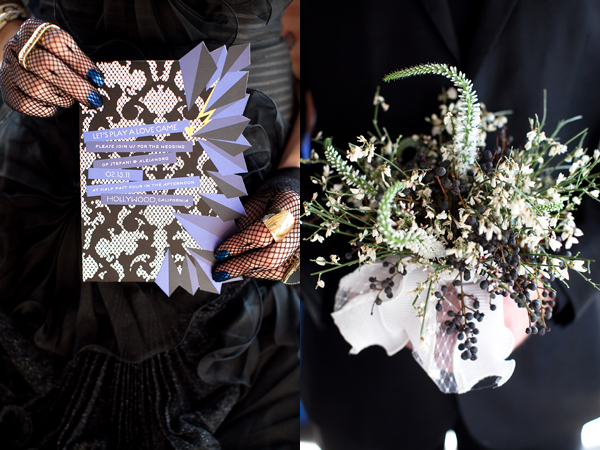 Below, love invite with origami, damask, AND lace: the basis of our concept. For the main show, I gave the bride and guys all bouquets. For the cocktail dress, I gave everyone boutonnieres. Very a-sexual and Gaga-esque, I think. Bubbles in our floralscape. Pink protea with feathery black tips in her bouquet. 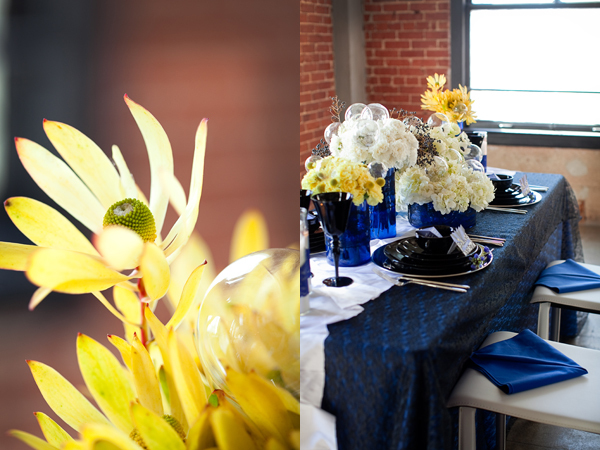 A table setting for Alejandro. In honor of Lady Gaga’s infamous meat dress, we had proscuitto served over tofu, with sea salt & black sesame. 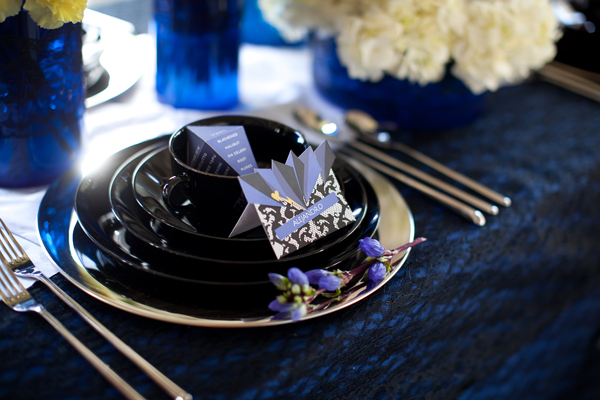 A blue lined, lace overlay table setting with a white origami fabric runner. 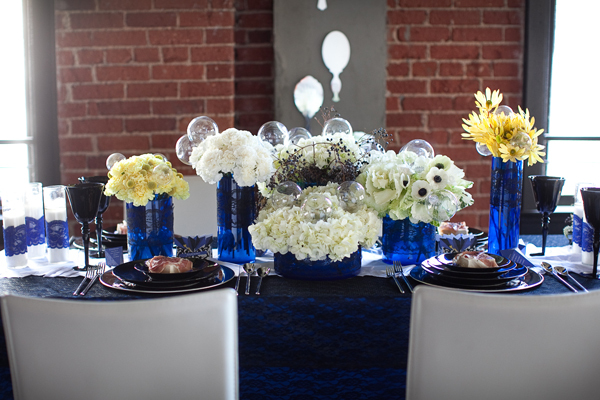 Candles and blue glass vases were all wrapped in lace. The glassware and china were so chic. 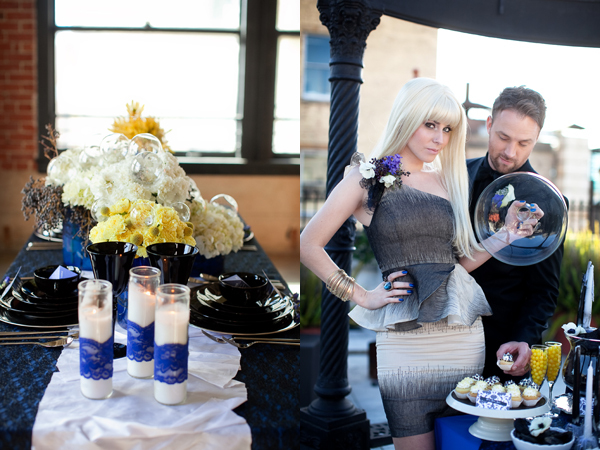 Ashley Taylor Photography – she shared her LOVE for Gaga with us that day, and we had no idea! 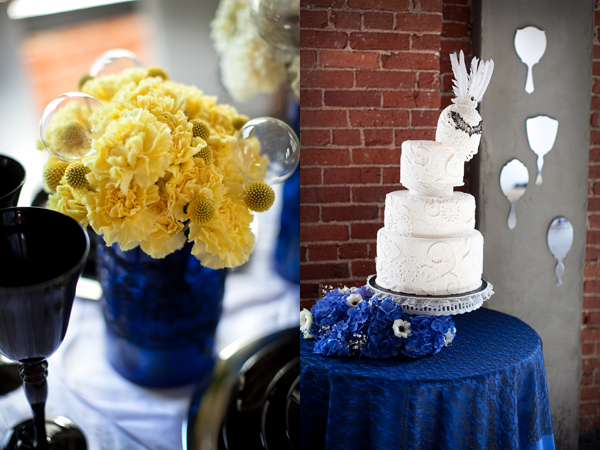 Zoie Events – rocked my world with this shoot. SO professional, prepared, the day flowed flawlessly.. EVERYONE on the set commented how organized it was. 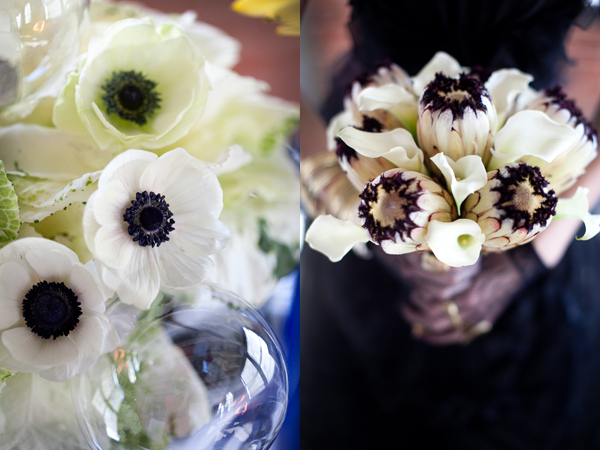 Pitbulls & Posies – Darling, fresh, and innovative. LOVE. My favorite were the menus! Susie Chhuor Make up & Hair – so fantastic to work with.